The financial world is a conservative one, especially in the United States. Financial institutions do not like change, especially the kind of sudden and radical change brought on by blockchain technology. And for good reason. These institutions handle the most regulated and sought after assets in the world: the U.S. dollar. Considered the world’s reserve currency, the U.S dollar is one of the most regulated currencies in the world. Yet it is also the most traded currency in the world, with about $15 trillion dollars exchanged every year, and the central currency most other currencies trade against. This makes it ideal tender for black market participants, even leaving the use of crypto for illicit activities “small” in comparison. With these facts as context, we cannot blame the financial institutions and money service businesses from being very cautious in their approach to integrating blockchain. Wait, what’s that you say? You think it’s obvious why big banks, governments, and the old world order wouldn’t want their power and money threatened by this new, liberating technology? Well, I am glad you brought this up! This is a sticking point for many who are dismissive of the concerns of financial institutions and view regulations as unnecessary obstacles. We need to make some distinctions here. The preservation of currently prevailing money transmission methods goes well beyond the agendas of governments and big banks. That is a more political, overarching discussion about the nature of currency and finance. Instead, let’s look at this issue in the context of the cross-border payments market, which the Boston Consulting Group estimates to be at $22 trillion in 2016, and rapidly expand to a $47 trillion one by 2026. This is a market that principally deals with USD for international purchases, payments, and remittances. In general, money service businesses (MSBs), like any other capitalist business, love efficiency and cost-reduction. So what then are the hurdles between these MSBs and the adoption of blockchain-based transfer methods? What is stopping for-profit companies from integrating technology that is clearly faster and cheaper than current methods, and will make them more profit? Leios has asked this very same question and thoroughly researched it. We present a three-part problem, and provide for it a three-part solution. Moving money across borders comes with very restrictive regulatory and logistical challenges. For U.S businesses that are transferring on behalf of customers, they have to adhere to the very comprehensive and demanding standards of Regulation-E, set in place by the Consumer Financial Protection Bureau. These regulations require KYC/AML, disclosures on all fees and exchange rates during or shortly after the transaction, mandatory refund periods, and rigorous record-keeping and reporting requirements; this all before we say the word blockchain. But blockchain itself can be a solver of many of these issues. Jesus Rodriguez, a columnist at CIO.com, speaks about how security tokens may help in compliance measures through programmable regulation. We can apply the same principles of decentralized verification and reporting and to the transaction mechanisms themselves. One of the main unique selling points of Leios is a suite of compliance tools provided to every MSB that integrates with our system. We currently have six tools planned which help with KYC/AML, reporting requirements, regulation-E receipt issuance, and other common problems related to traditional transfers. As for the concerns that stem from blockchain technology itself, these are offset by the system Leios provides. By default, blockchain anonymizes the user and publicizes the transaction, while MSBs basically need to do the opposite. 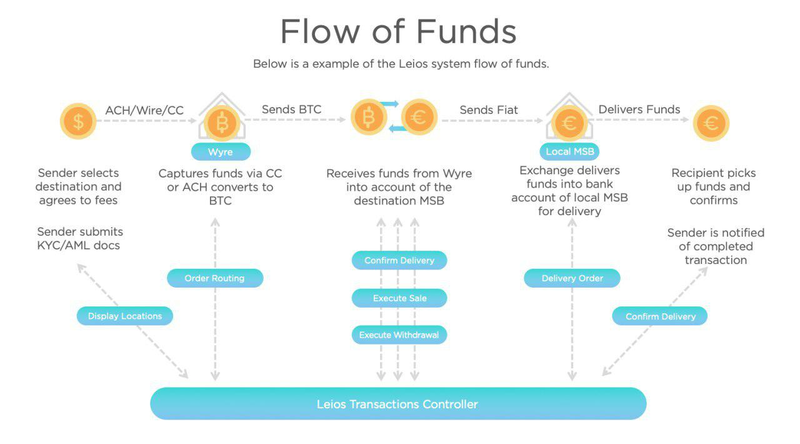 Leios introduces internal accounting features which allow for the records to be generated and tied to senders of blockchain-based transfers, while also using workarounds that prevent the individual amounts of any transaction from being apparent on the public ledger, such as batch transfers, redirects, and other newer means such as atomic swaps with a zero-knowledge intermediary token, and the privacy of lightning network transactions. As explained above, financial institutions like to stick with what is familiar, so much so that in 2011, they voted against a faster system that would simply ensure same day settlement. That same article also cites a Glenbrook partners’ survey of payment professionals offering their understanding of why banks are not upgrading to faster systems. Two thirds of participants cited operational issues/demands as the main factor. Put simply, banks don’t think it is worth the hassle to put any new risks in what they view as their perfectly fine system. 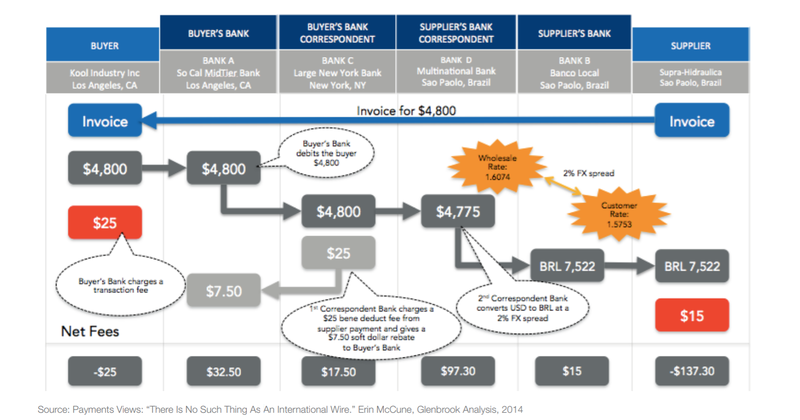 The flow of funds of traditional SWIFT-based transfers, as explained by Glenbrook Analysis. This method takes several steps with profits made at each step, culminating into an unnecessarily long and expensive process for the sending of data over a wire. While banks represent the most conservative of MSBs, the switch to a different transfer system is something daunting to anyone who handles money. There are new technologies to learn and new liabilities to worry about. In this context, it becomes easier to see why cross-border payment providers are still preferring the higher fees and slower systems. Not only do they work, but they fit perfectly in the current regulatory and company risk assessment frameworks. For this reason, we cannot expect these MSBs to go out of their way to bring unfamiliar technology into the heart of their business. Rather, we need to take the technology to them. It must be made as simple and accessible as possible. The businesses should not need to know anything about blockchain except that it works, and these are the buttons to press to use it. If blockchain is Linux command line, then these companies need to be given Windows: a simplified OS that puts the code in the back end. This is an integral part of the way blockchain needs to be presented to financial institutions in order to start its adoption into mainstream enterprise use. Finally, it should go without saying that any true solution must provide entry and exit into fiat, as it is impractical — if not impossible — to expect the parties involved in the transaction to take care of crypto-to-fiat conversion wherever they are in the world. We should remember that it is just in recent years that the developing world has seen a rapid adoption of mobile money and cash-less payments. Expecting them all to now also understand and use blockchain technology is not a practical solution. The final problem we’ve identified is the immaturity of blockchain cross-border networks, the outcome of which is limited locations supported by blockchain transfers. For example, as of its last announcement in September, Ripple was operating in 40 countries. This is quite far from being a global network. The top remittance companies which operate in practically every country with various onsite locations. Ripplenet seeks to replace SWIFT, which operates in 200 countries and territories. This problem of is amplified by the fragmented nature of the market, with interoperability between solutions marred by the desire of every solution provider to have its own token for the benefit of its own platform. Every new company that uses its own blockchain and token adds an inbuilt barrier to their solution becoming universal. Hence, there needs to be a way to glue together the different systems, and then package and present them to MSBs as a single, comprehensive solution. This network of networks will thus offer multiple options through multiple locations, speeds, rates, and transmission methods. Leios will act as an orchestrator between these networks, and will link them with two other types of business that also teeming with potential: crypto exchanges and existing MSBs. Blockchain services designed for cross-border transfers like Ripple and Stellar are not the only emerging corridors that MSBs can use for cross-border payments. They may be optimized for this purpose, but Leios sees much opportunity in the growing industry of cryptocurrency exchanges. 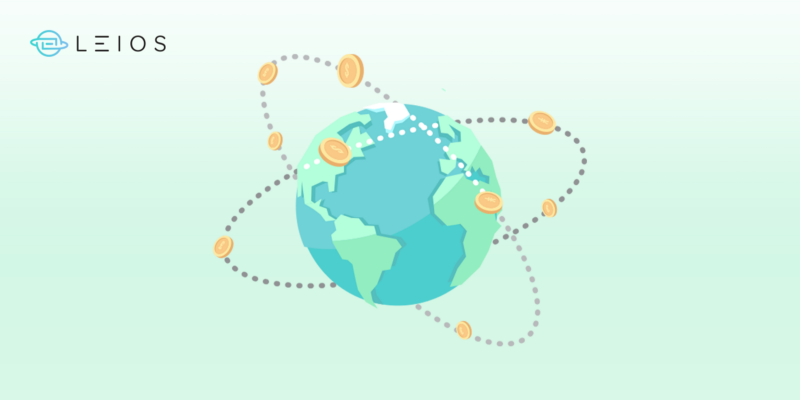 With over 233 exchanges listed on CoinMarketCap in locations all over the world, these exchanges can be at the center of post-banking dominated cross-border transfers. The final piece of this orchestrated network will be our self-built gateways, designed specifically for our system to fill in any gaps for in-demand gateways, and to optimize our orchestrated routes. These gateways will be possible after Leios obtains its own licensing, and will require boots on the ground in various developing countries around the world. Leios plans to work with existing MSBs in these locations, providing them the tools to upgrade to blockchain technology in return for being an exchange point and fiat gateway for their locations. If you were to ask the average MSB right now the size and completeness of the cross-border blockchain network, they may not know or even think it matters to them, due to their own barriers of entry to the use of blockchain. The preamble to such a network having market relevance is the ability to access it seamlessly and without regulatory risk. These concerns are solvable through the tailor-made software solutions Leios is providing. Every piece is required to create the truly market usable cross-border solution. In this current age of SWIFT, there is no way around correspondent banks as the bottleneck for cross-border transactions. They are the orchestrators of their own network. Leios is looking beyond just beating bank transfers in speed and cost per transaction. Bitcoin did this on its first day. It will take a full solution which addresses every element of the needs of cross-border payments, be they logistical, regulatory, or practical. Through this approach, the Leios System will be the one stop shop to take any MSB at any stage in understanding blockchain technology, to using it the next day.